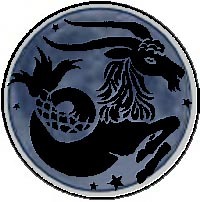 There is a Blue Moon during June/July 2005, in Capricorn, the sign of the Sea-Goat. This is a double Cancer Full Moon, as the Moon is Full in the opposite sign to the Sun. Richard Giles, astrologer and feng shui consultant, has been researching the rare phenomenon known as the Blue Moon. He explains that a Blue Moon is when a Full Moon occurs twice in the same zodiacal sign in a single year, not just in the same calendar month, as is often put about in the media. The second Full Moon of the two is known as the Blue Moon. On 22nd June 2005 we have a Full Moon in the Earth sign of Capricorn, at 1 degree and the following one, the "Blue Moon", is in the same sign at 28 degrees 45 minutes. Each Moon is a time for great ceremony, meditation and a new way of looking at the world. The blue skin of Krishna, the creator, the god of the flute and the divine partner of the milkmaids of heaven, is celebrated now. This will be an event when we can appreciate the energies of Capricorn and its earthy, very practical ways of arranging the material assets of the planet. This will be a time for us all to appreciate that material wealth and bounty from the exploitation of natural resources will not solve all our problems. Indeed, it's better to look at the wise and sensible use of all the planet's physical and geopolitical issues as soon as possible. A warning from hundreds of prominent scientists, issued earlier in 2005, tells us that just a few years exist during which we must turn around exploitative resource policies, or we can expect decades of climatic excesses and mass extinctions of animal and plants—and maybe part of the human race. Click here to select 2005—Year of the Great Breakthroughs or view Your Year Ahead in 2005.